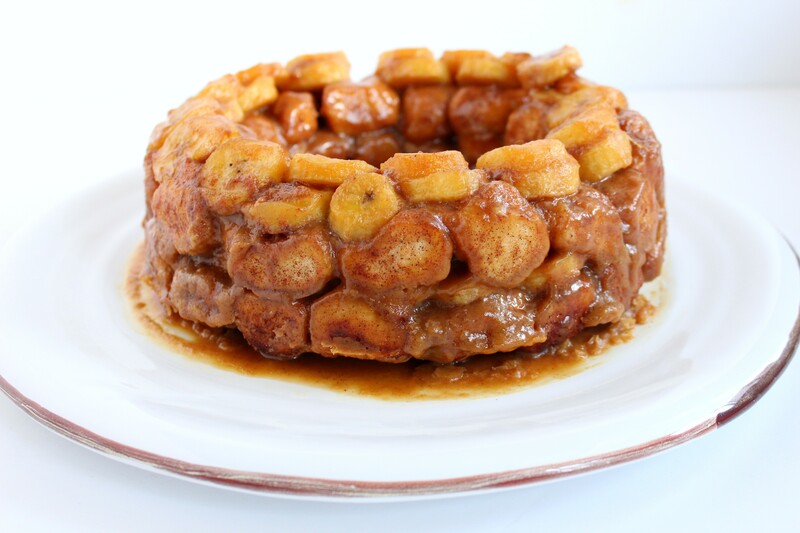 Sweet, ooey gooey, monkey bread gets a Cajun twist with my lightened-up Bananas Foster Monkey Bread. This decadent treat is complete with a bourbon caramel sauce that will have you thinking you’re in the French Quarter! It’s no secret that I have a sweet tooth and breakfast is no exception. 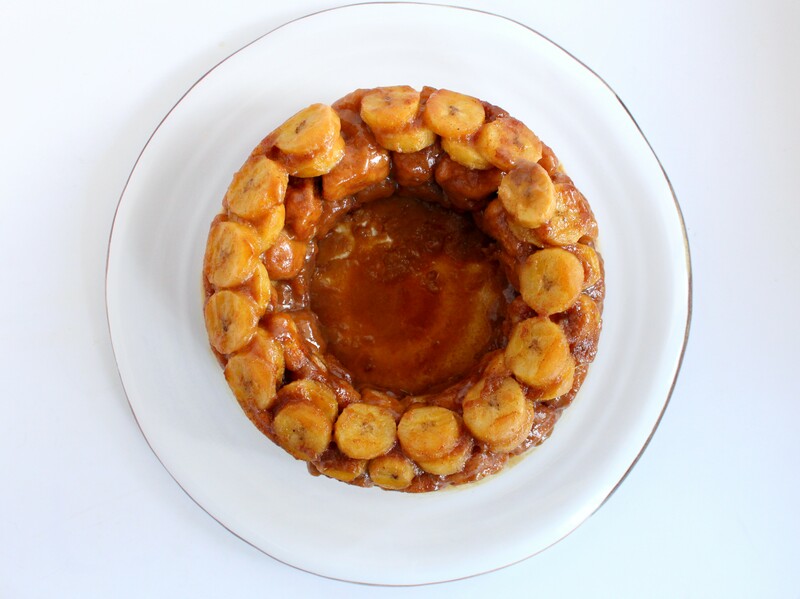 One of my favorite breakfast treats is monkey bread. As if biscuits aren’t good enough on their own? Adding a caramel sauce takes it to a whole new level. 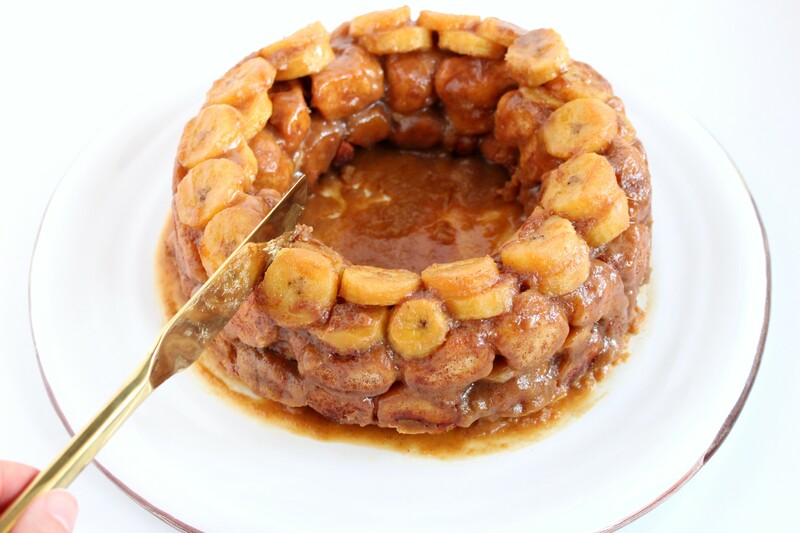 I’m taking it a step further and adding a Louisiana twist- Banana’s Foster Monkey Bread. I know what you’re thinking—oh my sugar coma!! Usually with a recipe like this, yes, but this one cuts down on the sugar by using Swerve. This delicious natural sweetener measures cup-for-cup like sugar AND browns like sugar. Bakers rejoice! Swerve is made from ingredients found in select fruits and starchy root vegetables, and contains no artificial ingredients, preservatives or flavors. It’s zero-calorie, non-glycemic and safe for those living with diabetes since it has no effect on blood glucose or insulin levels. As a dietitian, I am always looking for ways to cut back on sugar. Swerve helps me satisfy my sweet tooth without compromising my health! The main ingredient in Swerve is Erythritol. It has a high GI tolerance so you won’t be running to the bathroom after eating this decadent treat. Swerve was born and raised in New Orleans so when I got to thinking about recipes for this post, it had to be a Louisiana treat. My family is from Lafayette, Louisiana so I’ve tried the best king cakes, pecan chewies, pralines, ginger snaps, beignets, and of course bananas foster. I may be a little bias, but I’m convinced my dad makes the best bananas foster. That hot bourbon caramel sauce over the chilled vanilla ice-cream. You can’t beat it! However, my monkey bread comes close. Try the recipe today and let me know what you think! 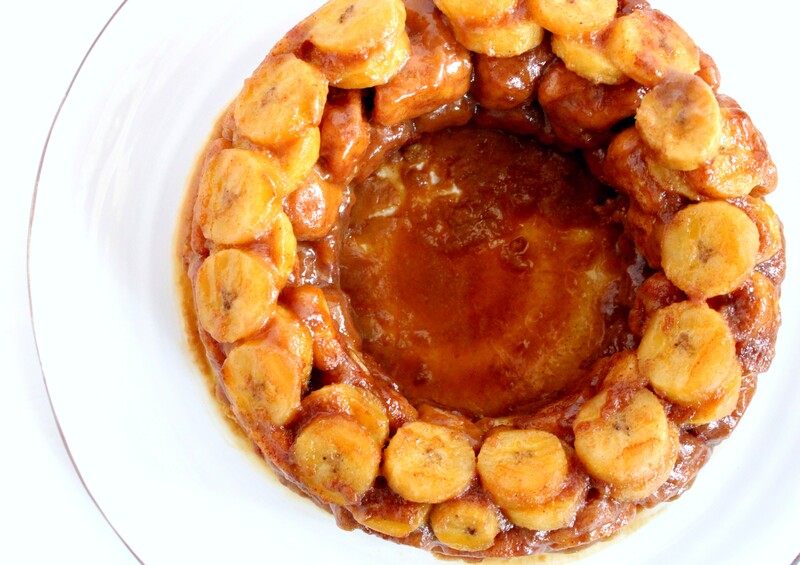 Sweet, ooey gooey, monkey bread gets a Cajun twist with my lightened-up Banana's Foster Monkey Bread. This decadent treat is complete with a bourbon caramel sauce that will have you thinking you're in the French Quarter! Preheat oven to 350 degrees. Heavily grease a bundt pan with nonstick cooking spray. Set aside. Combine ½ cup swerve granular and ½ tablespoon of molasses to create a "brown sugar". Mix well. Add cinnamon and mix. Cut the biscuits in half and roll each piece in the cinnamon sugar mixture. To make the caramel sauce, in a medium saucepan, combine 1 cup of swerve, granular and 1 tablespoon of molasses. Stir the mixture to create "brown sugar". Add half and half, butter, and pinch of salt. Bring to a boil over medium heat. Stir continuously, cook until the mixture thickens and deepens in color, approximately 7-9 minutes. Add vanilla extract and bourbon. Continue to cook for another 1-2 minutes. Line the bottom of the bundt pan with half of the sliced bananas. Drizzle ⅓rd of the caramel sauce over the bananas. Layer the sugar-coated biscuits over the bananas and caramel in the pan. Add the remaining banana slices in an even layer over the rolls. 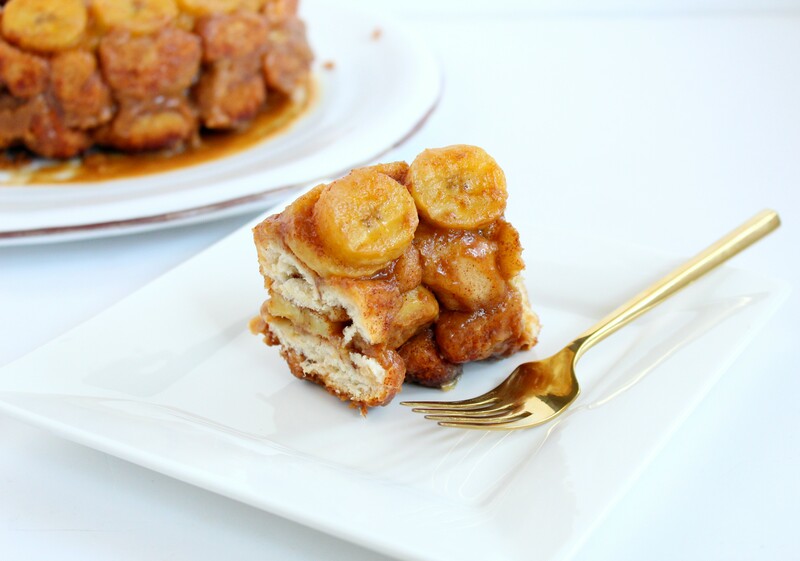 Drizzle ½ of the caramel sauce over the bananas and add the remaining biscuit halves. Pour the remaining caramel sauce over the final layer of rolls. Place the bundt pan on a rimmed baking sheet and bake for 30 minutes. Allow the pan to rest for 5-10 minutes. Turn out onto a large serving dish that is at least a couple inches wider than the bundt pan when turned out. Serve immediately. OMG – this looks AMAZING!!! Pinning! Gorgeous! I’m totally making for my little monkeys!